I just discovered this site yesterday thanks to this month's "3D World" magazine and, I have to say, I'm VERY excited about the desktop motion capture system. I'm currently training to be a Massive TD (massivesoftware.com) and one of the hardest things about it is getting hold of decent motion capture data (I know that there's tons of it on the web, but not much of that is suitable for use in Massive) so the thought that I could generate my own mocap is very exciting indeed. Yes, I see what you mean. Perhaps a tweak on one of the values will turn them in the correct direction. Looks impressive for a first run though. Never used Massive; is that a crowd simulator? I haven't had chance to investigate yet, but you're right. It probably just needs a few tweaks to the bone parameters. I tried it with the other BVH file of the guy dancing and the legs do move the way they should, so it should be an easy fix. Thanks for posting this interesting video. You can try the new animation samples, maybe Massive will like them more. If you have an example of a skeleton that Massive can import correctly you can use our motion transfer to re-target animations to that skeleton. See the "Export" tab in iPi Studio. As you can imagine, it would be almost impossible to skin any geometry to it in this pose. There may be a way to fix this inside Massive though. I will look into it. Here's a trick you can try: open the mocap file in iPi DMC. There are probably frames of the rig in the original T-Pose before the frame where you set your own T-Pose and started tracking. Select the Actor and select Copy Pose from the Edit menu, and paste that pose in the first frame of the range you're exporting. The T-Pose will not necessarily be where the animation starts, but it should be at the origin of the scene (unless, I guess, you used Recenter Coordinate System on the moved Actor, but you can set this back of course by selected the unmoved/posed actor and Recenter.) This should be suitable for 'skinning' or binding your character in another 3D app. Having the original T-Pose at the original at the beginning of a motion clip can also help with other things like being able to use dynamics (cloth, hair, etc.,) properly. This may or may not be helpful with some 'motion-mixing' apps though. Apparently, you used the walk.bvh file from our Gallery page. Try alternative formats - walk_biped.bvh or walk_endorphin.bvh, maybe Massive will like them. Better yet, import your own character into iPi Studio and your animation will be retargeted to your rig. (Use "Import target character" on "Export" tab. ) In this case, you won't have to do any rigging or skin binding at all, because exported animation will be fully compatible with your skeleton and your skin weights. Strictly speaking, this is a problem with Massive. 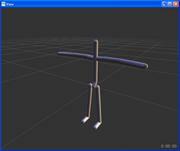 All animation samples from our Gallery page have first frame of animation set to T-pose. This is easy to see if you open our BVH samples in any BVH viewer. For example, you can use BVHacker ( http://www.bvhacker.com/ ). (By the way, iPiStudio also functions as a viewer for any BVH files - use File->Import menu item). In fact, iPi Studio always inserts meaningful "default pose" as the first frame when exporting animation. "Default pose" usually means T-pose, but for some formats it can be different from T-pose (for example, Valve Biped characters have different default pose due to Valve requirements). For custom characters, "default pose" is set to the pose that was in the first frame of the imported character file. In fact, iPi Studio always inserts meaningful "default pose" as the first frame when exporting animation. That's good to know! Thanks for the info!